With cart abandonment rates averaging approximately 68%, following up with your customers to remind them to purchase the items they're leaving behind can instantly boost your sales. SmartrMail allows you to send up to 3 follow up emails when a customer abandons their cart on your site. Follow along with the video or the tasks in this article to start recovering abandoned carts and getting more sales. Step 2: Navigate to the Abandoned Carts tab and scroll down to send settings. Step 3: Under the Frequency tab, set how many emails you'd like to send and the time trigger for each. Note: For Neto stores a cart is only considered abandoned when unchanged for 1 hour. Therefore the triggers will have 1 hour added to them. Step 5 (optional): If your product images vary in size. Add a height constraint under the Styling tab to create a more uniform look. Step 6: Click the Enable Abandoned Carts button at the top right of the tab. Will abandoned cart emails link to my cart or products? 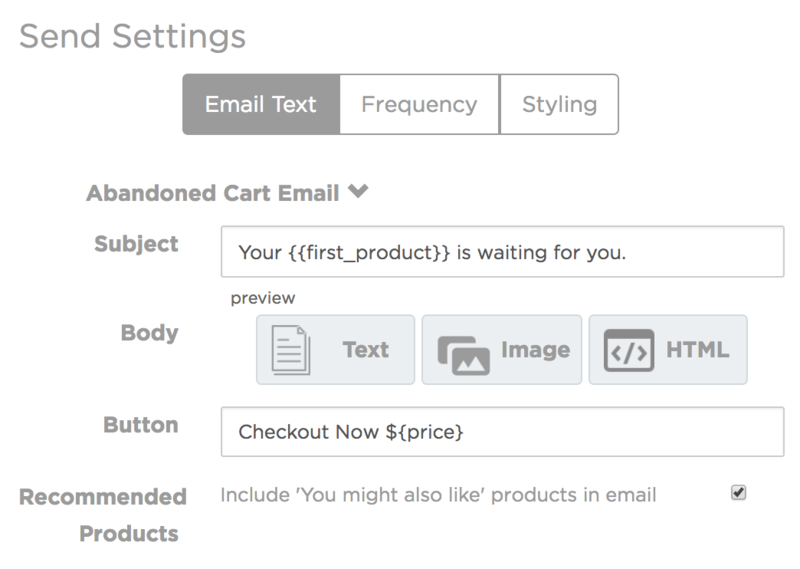 For Shopify and Neto, the abandoned cart emails will link to the customer cart. This won't work on test emails as the cart is only created on actual emails. For BigCommerce the links will link back to the products on site.